Fresh off a summer of touring and festivals, Brockhampton have announced a new album and North American tour for this fall. The tour will kick off in Mesa, Arizona on October 3 and continue through to their show in Las Vegas on December 6. Along the way, the hip hop music collective will do two New York City shows at Terminal 5 on October 21 and 22. The “I’ll Be There Tour” will be in support of their recently announced fourth studio album, Iridescence, due out in September via RCA. The album previously carried the names “PUPPY” and “The Best Years Of Our Lives” but it looks like the third name will stick with the album dropping sometime this month. Kevin Abstract, the de facto frontman of the band, teased some hints about the album on Twitter last week, stating that the album would not have been possible without their recent European tour. In an image shared on Twitter, they’ve also added a subtitle to the album, reading “Made in London,” referencing the album being recorded at Abbey Road. In support of the title change, Abstract also tweeted, “brand new music brand new feelings iridescence,” adding that they wanted to release music they felt proud of and went on to thank fans for their patience. Brockhampton, stylized as BROCKHAMPTON, are a musical collective based in Los Angeles and are known for their artistic and alternative hip hop style. The self-proclaimed “boy band” have been on a rapid uphill climb lately, hot off their inaugural European tour and their sets at Reading and Leeds in late August. 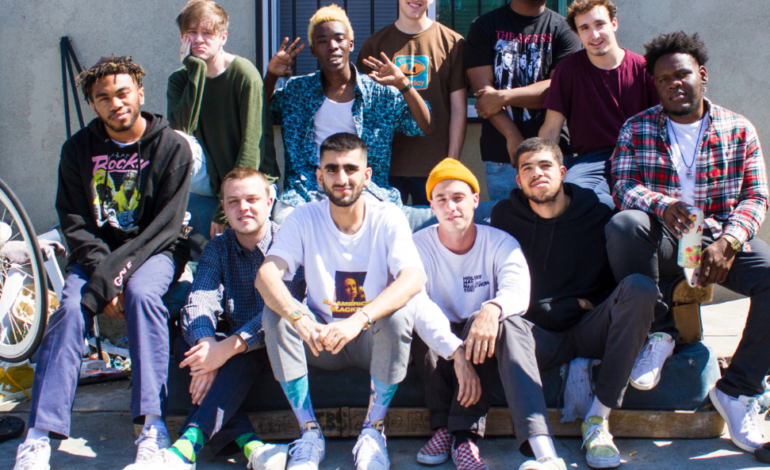 In recent months, the band have released several singles, following their 2017 LP Saturation III, concluding the Saturation trilogy which began in early 2017. Abstract founded the band through a post on a Kanye West forum, receiving dozens of interested members in forming a band. The result was the band, AliveSinceForever, which disbanded to reform as Brockhampton following the release of their first EP. Since their inception, Brockhampton have reached international acclaim and inspired thousands of fans through their raw, unfiltered lyrics and honest demeanor with fans in both their work and lives. Catch Brockhampton this fall at Terminal 5, with tickets going on sale September 8 for both shows.